If you’ve been on the Internet at all today, then you likely know everything there is to know about the incredible General Larry Platt and his anti-sagging rap “Pants on the Ground.” The guy is everywhere! The New York Times has written about him three times, his life story (which is pretty impressive) has been dug up, and the YouTube versions of “Pants on the Ground” are increasing at an exponential rate. Now Neil Young’s cover is here. 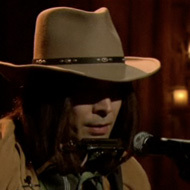 Earlier today at the taping of Late Night with Jimmy Fallon, the legendary singer-songwriter delivered a heart breaking rendition of “Pants on the Ground.” It’s stirring.